I can almost taste the Halloween candy! I have a Ghoul’s Night Out card for the blog hop with Lawn Fawn and Scrapbook Adhesives by 3L® this week. Today is the last day, be sure to visit both blogs and enter to win some great prizes. Disclosure: I received products from both companies for this blog hop. I just got some new watercolor pencils, and oh, I’m in love! Realize this is my first go at them, but I do love how they blended, even if I got too much water on the background. Die cutting with these is so easy, you can see the stamped lines from inside the die, just line up, secure the die in place with low tack tape and cut. 3D Foam Squares give the ghouls a nice pop, and the Creative Photo Corners frame the image nicely. You can see more of this card, and today’s other bloggers, and the links to the rest of the week’s posts, AND to Lawn Fawn on the Scrapbook Adhesives by 3L blog. No candy corns were wasted in the making of this project. Thanks for visiting and be sure to follow my Facebook page Cookies for Breakfast for more blog hops & giveaway info! Blog Hop with My Favorite Things Stamps! Hi and welcome to the second day of the hop with MFT and Scrapbook Adhesives by 3L®! See all of the projects and enter to win awesome prizes (like 3 from each company are up for grabs!) find all the links for yesterday, today and tomorrow here. I have received product from both companies for this post. I’m a big coffee lover, when I saw this set I just had to have it, and it would make a super cute shaker card too! Thanks for stopping by and be sure to visit Scrapbook Adhesives by 3L for all of the contest links. Thanks for visiting this short and sweet post! Today I’m happy to bring you this purple Rose Card featuring products from Scrapbook Adhesives by 3L and Altenew! So happy to have you here from Sveta Foninia’s blog! I fussy cut the images and adhered the stem with E-Z Dots Repositionable, so that you don’t see any adhesive. The bloom uses 3D Foam Squares to give it a pop off the card. I stacked the papers with opposite colored Photo Corners because I love the way it helps frame the central image. I actually colored this a few weeks ago, in front of the TV, just playing around with my markers. I haven’t done much coloring in a while, it was nice to relax. I’m a little rusty, but I think it turned out OK. I thought the yellow would be nice, but it was too light, and then I really loved how the purple turned out. Enter here: a Rafflecopter giveaway Click this link to enter your contact info so you qualify for the drawing, and leave your comment below. Thank you! Your next stop is Svitlana Shayevich’s blog! Disclosure: Product was given to me by Scrapbook Adhesives by 3L and Altenew for this blog post. Happy Tuesday everyone! Thanks for visiting today! 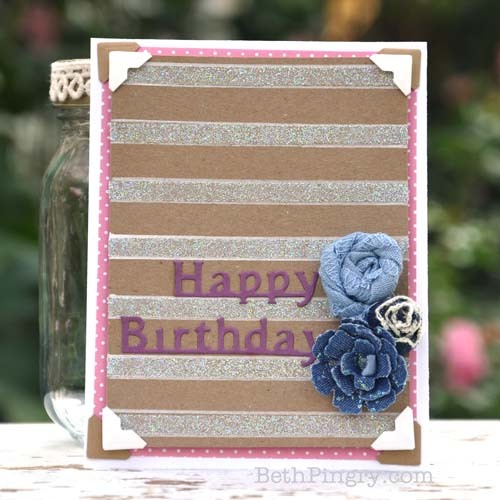 I have a birthday card with a glittered striped background. All the details are on the Scrapbook Adhesives by 3L blog. Sorry for the short post, I’m running ragged with classes, meetings and lots of house projects. More updates soon! Hello friends! Just a note and a card this morning, and an invitation to come back again tomorrow for NSD! First – I have this card at A Jillian Vance Design, I really love this color combo of teal and red, and those awesome buttons too! I used adhesives from Scrapbook Adhesives by 3L, Clearsnap inks, and Graphic 45 papers. Click the pic to see the post and full supply list. Shaker Card with 3D Foam Creative Sheets! Hi everyone, I have an easy to make shaker card today on the Scrapbook Adhesives by 3L Blog. I’ve been crazy busy and will be catching up on a few other posts, thanks for visiting and see you again soon!